I have a thing for crime novels set in the rural South. You can blame the likes of William Gay, Tom Franklin and the sublime Daniel Woodrell for that. 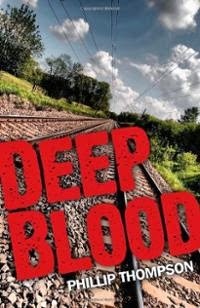 So when Phillip Thompson described his new novel, DEEP BLOOD as “Southern-fried noir” I was all in. Shall we take a look? Sheriff Colt Harper is a product of his environment and also of his family history. Both weigh heavy on him when the son of his high school sweetheart is murdered on the same day that his alcoholic father is arrested for DUI. Colt has sworn to up hold the law, but it is never just about right and wrong, not when it comes to friends and family. The Sheriff of Lowndes County has has to come to terms with his own past sins as his hunt for the boy's murderer uncovers another long forgotten crime, buried deep within the racial prejudices of rural Mississippi. DEEP BLOOD unfolds at a leisurely pace, with plenty of time being devoted to the study of its damaged protagonist and beautifully flawed supporting cast. The highlight of which is the wonderfully flaky Lydia, Colt Harper’s weed smoking, ex-stripper girlfriend. Thompson's prose is a solid and reliable story telling vehicle. He weaves the murder / mystery elements of the plot around his characters by the clever use of alternating points of view. Although it is Colt Harper's perspective that holds sway and pulls these threads together as Harper himself slowly unravels. Phillip Thompson has produced a gripping and thoughtful southern noir novel with plenty of atmosphere and a real sense of place. DEEP BLOOD is a winner. It shines like morning dew on the Kudzu.